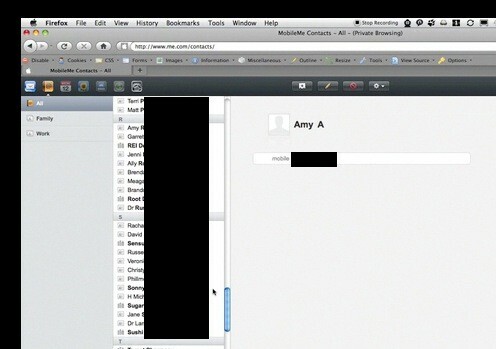 MobileMe mixup: Address book snafu exposes personal data to strangers? | "The CTI Blog"
MobileMe mixup: Address book snafu exposes personal data to strangers? Face it: your address book and your contacts, they’re personal. They reveal a lot about you: your friends, your business partners, your cake buying proclivities, and more. The address book you see at the top of this post appears to be for someone in the Denver area. I know that because of the REI Denver listing and Le Bakery Sensual on 6th, which I drive by whenever I head East from Broadway. These contacts, along with their notes, their phone numbers, dates of birth, and other information say a lot about the person whose address book this is, and also about the people who appear in that contact list, with all their personal and professional info. There’s one big problem. The screen shot you see wasn’t made by the person who owns this me.com account. Under certain very specific conditions, Apple is inadvertently sharing data from other people’s accounts. Ouch. A TUAW reader sent us a video made as he renewed his me.com account from the UK. The address book data he accessed during that time included this Denver-based set shown here, as well as data from an Ireland-based user of Polish descent (all his contacts were back in Poland although his business was based in Ireland). This all went down during the period when his MobileMe account was renewing. Each time he logged off and back on, he was presented with yet another set of contacts–none of them his. He writes, ‘Each time I logged off and on I got a different address book. All the other options were disabled (because my renewal was being processed) but clicking the Contacts icon showed me *an* address book,’ just not his address book. With a little Internet-fu, he checked out some of the numbers and found that they were valid and operational. This leads him to believe that this is real data. My inspection of the local Denver data from his screen shots convinces me of the same. Further inspection of work addresses and personal family names makes us believe we know whose Denver-based address book this is. We’ve attempted to contact this person but as yet have not heard back. TUAW has sent a heads-up to Apple and will keep monitoring the situation to see how it develops. TUAWMobileMe mixup: Address book snafu exposes personal data to strangers? originally appeared on The Unofficial Apple Weblog (TUAW) on Mon, 12 Oct 2009 20:45:00 EST. Please see our terms for use of feeds. This entry was posted on October 13, 2009 at 6:44 pm and is filed under Apple Vulnerabilities, Privacy. You can follow any responses to this entry through the RSS 2.0 feed. You can skip to the end and leave a response. Pinging is currently not allowed.